American troops have clashed with suspected Turkish Kurd rebels based in northern Iraq. The US military confirmed that fire was exchanged between "unknown forces" and an Iraqi border patrol supported by US forces. The statement came after Turkish Foreign Minister Abdullah Gul said that US forces had clashed with PKK rebels. If confirmed, it would be the first known clash between US forces and the PKK. A spokesman for the US 101st Airborne Division, based in Mosul, said the incident took place near Dahuk, about 10 miles (15 kilometres) from the Turkey-Iraq border. One member of the Iraqi border patrol was killed, he said. The "unknown forces" were dispersed with the assistance of Apache attack helicopters and a quick reaction force team, he added. Turkey and the US have agreed an action plan to eradicate the PKK, which is thought to have about 5,000 members living in northern Iraq. Details of the plan have not been released, but a US official said at the time that any military action would be carried out by American troops. Ever since the US occupied Iraq, Turkey has been pressing Washington to take action against the group, which both countries regard as a terrorist organisation. Turkey and the PKK fought a bitter war for more than a decade. More than 30,000 people were killed, and more than a million displaced from their homes - largely in the predominantly Kurdish south-eastern part of the country. 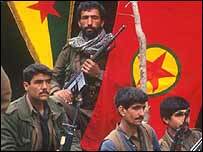 The PKK have long sought refuge from Turkish troops in the mountains of northern Iraq.